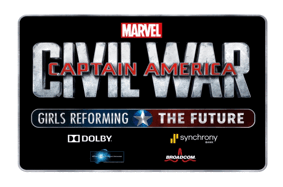 BURBANK, Calif. (April 6, 2016) — Disney, Marvel Studios, Dolby Laboratories, Synchrony Bank, Broadcom MASTERS and Science & Entertainment Exchange, a program of National Academy of Sciences are proud to announce the five finalists of MARVEL’S CAPTAIN AMERICA: CIVIL WAR – GIRLS REFORMING THE FUTURE CHALLENGE in conjunction with the May 6, 2016 release of Marvel’s “Captain America: Civil War,” starring Chris Evans, Robert Downey Jr., Scarlett Johansson, Sebastian Stan, Anthony Mackie, Don Cheadle, Jeremy Renner, Chadwick Boseman, Paul Bettany, Elizabeth Olsen, Paul Rudd, Emily VanCamp, Frank Grillo and Martin Freeman with William Hurt and Daniel Brühl. Over 1,000 amazing girls from across the country took the challenge. Maia developed a “seeing eye” robot as a cost effective and durable alternative to a seeing eye dog. The self-propelled echo-locating seeing eye-bot is made of readily accessible materials, making it more available to individuals of limited financial resources. Maia designed the seeing eye-bot to require minimal maintenance and to have a functional life span in excess of 7 years. Maia hopes her invention can address the needs of the visually impaired who may be unable or unwilling to own a seeing eye dog. Margaret created an automated audio level regulating program for headphones she calls “the headphone stairs”. Margaret addressed the issue of hearing loss being caused by the use of headphones or earbuds for extended periods of time. She created a computer program that will progressively reduce the volume of your headphones at pre-designated intervals. Margaret hopes her program will help people safely use their listening devices without fear of damage to their hearing. Janie developed an inexpensive and efficient method of room decontamination. She created a novel combination of anti-microbial compounds that is highly effective against drug resistant pathogens. Janie’s decontamination unit utilizes an acoustic wave device to deliver the anti-microbial compound in vaporized form, providing a sterilization method more efficient and comprehensive than is possible by hand. Janie hopes that her decontamination system, can create a safer and healthier environment in hospitals, schools, movie theaters, and homes. Vivian designed and built an efficient and cost effective hybrid solar thermal collector for residential space and water heating. This hybrid collector can operate on either water or air, which provides maximum flexibility for home usage year-round in all climates. The design is inexpensive to replicate and easy to use and install. Her collector can potentially generate 88 watts/ m2 vs. the 22 watts/ m2 generated by typical solar panels. Vivian feels the use of hybrid solar thermal collectors could help address the excessive use of climate impacting non-renewable resources, currently still conventional for space and water heating in homes. Holly designed a network of inexpensive mobile computers with surveillance and education capabilities run on renewable energy. Holly built a modular computer with a wide range of capabilities. Her solar powered computer system includes Bluetooth, WiFi, and surveillance capabilities and is loaded with 64 GB of educational software. The system is designed to provide underserved communities in developing nations access to computers and education inexpensively and without the need for Internet access. Holly’s mobile computers are loaded with over 3000 e-books, educational videos, textbooks, medical journals, and programming software. The system also serves as a central hub for a surveillance network to provide a community early warning system. Holly’s aim is to improve the lives of individuals in underserved areas of the world by addressing three main world issues: education, security, and communication. The challenge invited girls nationwide, ages 15 – 18, in grades 10 -12, to submit innovative STEM (Science, Technology, Engineering, or Mathematics)-based projects that have the potential to change the world. Each applicant was asked to submit a short video demonstrating her project and explaining how her science and technology-based project could make the world a better place. Five finalists were selected to come to California and present their projects to a panel of experts. Each finalist will receive: Two round-trip tickets to Southern California for the finalist and her parent or guardian, including scheduled meals, ground transportation to and from organized activities, hotel accommodations, from April 10 through April 13, 2016; an opportunity to be on the red carpet at the World Premiere of Marvel’s “Captain America: Civil War” at the Dolby Theatre® in Dolby Atmos® and Dolby Vision™ on April 12, 2016; a tour of the Walt Disney Studios in Burbank, California; and $500.00, deposited into a High Yield Savings account with Synchrony Bank. One grand prize winner will be selected from the five finalists to receive an internship with Marvel Studios.